Chalet Grand Coeur is our brand-new, gorgeously modern chalet sleeping up to 12 people. The elevated position gives this luxury chalet breathtaking mountain views from most bedrooms, the living areas and the several large sun terraces. This is a real treat for all mountain lovers looking for some contemporary luxury in the traditional village of St Martin de Belleville. 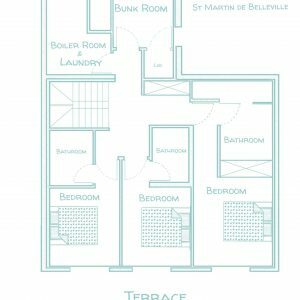 Spread over 4 floors, there are five bedrooms (2 doubles, 2 twins, 1 bunk-bed room) which all come with their own ensuite bathrooms. Additionally to that, there is a TV snug with two single sofa-beds for 2 extra children if needed. The stunning open-plan living area with dining table and designer kitchen is the true heart of the property, with its open-fire, French double doors and cathedral windows looking out onto the panoramic view of the mountains. A large sun terrace and balcony can be reached from two sides of the living area and come equipped with outdoor furniture for enjoying your morning coffee, or an evening drink – the perfect place to unwind after a busy day on the slopes. Three of the bedrooms lead out onto another huge sun terrace, one level below the living area. This chalet is all about soaking up those spectacular views! The property comes with 2 convenient private parking spaces in the large garage below the chalet, electric boot warmers, plenty of storage, a washing machine and dryer. Everything for enjoying an unforgettable ski holiday in the heart of the French Alps. 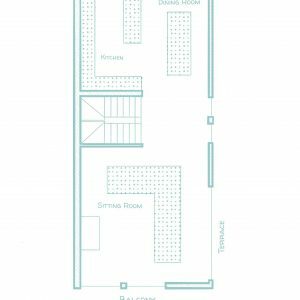 Only a few minutes walk down the road to the drag-lift and all village amenities mean that you have the comfort of everything being within walking-distance, without the hustle and bustle of being right in the centre. 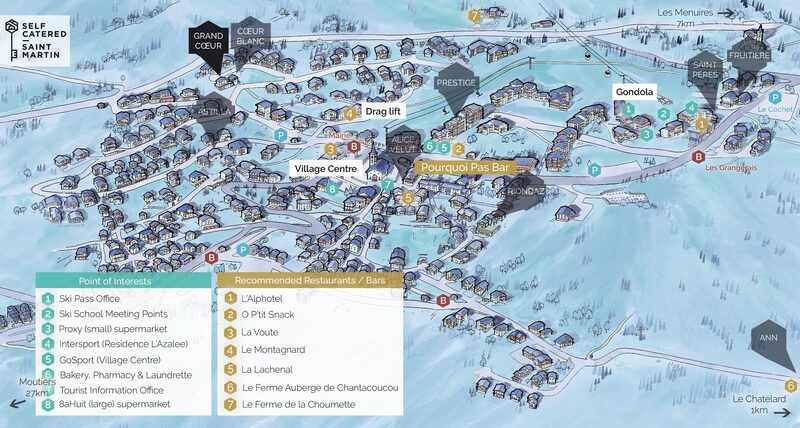 The ski slopes can also be reached via a 4-minute walk along a quiet residential road flat to the edge of the slopes, from where you can ski down to the village drag lift. Chalet Grand Coeur occupies an elevated position – looking over the whole village – which gives this chalet its abundance of charm. 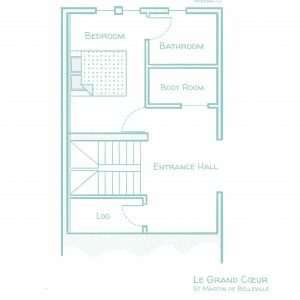 The prices above allow up to 10 people in ‘Chalet Le Grand Cœur’. 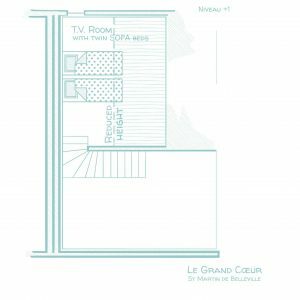 An 11th and 12th person can be added (sleeping on the sofa beds in the TV snug). Our ‘extra person fee’ is charged.